Dr. John Scharfenberg and Mrs. Ann Laville Scharfenberg honor Ann's sister, Cpl. Germaine Laville. 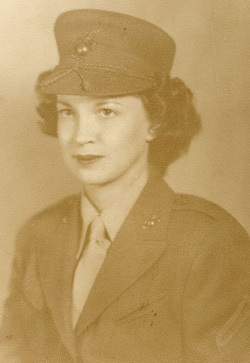 The Germaine Catherine Laville Scholarship, established by Dr. John Scharfenberg and Mrs. Ann Laville Scharfenberg, honors an LSU alumna who, when she was just 22 years old, gave her life in service to the United States during World War II. The oldest of seven children, Cpl. Germaine Laville studied elementary education at LSU and was a member of Alpha Chi Omega sorority before teaching grammar school in Iberville Parish. As the only service-eligible member of her family, Laville enlisted in the U.S. Marine Corps Women's Reserve in 1943. She was stationed at the Cherry Point Naval Air Station in North Carolina. Ann, one of Laville's sisters, recalled, "I was a young child when she died, but I am grateful that I do remember her. Of course, I know her from hearing my siblings, my parents and everybody who knew her talk about her. And I remember her having come home on a furlough in February or March of 1944. I remember that very well, just having a wonderful visit with her." A few months later, as she was instructing an aerial gunnery class, Laville's building caught on fire. She initially safely exited the building, but when she returned to rescue fellow Marines, she perished in the blaze. LSU's East and West Laville residence halls, now part of the Roger Hadfield Ogden Honors College campus, are named in recognition of her heroic efforts. Inspired to further establish Laville's legacy at LSU, the Scharfenbergs created a scholarship in Laville's name. "We wanted to honor her in some way and show the gratitude of our family to LSU. We wanted this gift to represent my siblings and all of us, because we are all very touched by the generosity of the school in naming the buildings after her. It was a wonderful way for LSU to honor her," shared Ann, who is also an LSU alumna. The Scharfenbergs chose to leverage an IRA charitable rollover to establish the scholarship. The Scharfenbergs call the move a "win-win," referencing the opportunity to make a tax-free contribution from their individual retirement account to the LSU Foundation. Such "rollovers" are now a permanent part of federal law, opening the door for donors like the Scharfenbergs to maximize their philanthropic investments. Put simply, said John, "It helps us, and it helps LSU." The Scharfenbergs envision that the scholarship recipients will be inspired by Cpl. Laville's story to "follow their dreams, work hard and serve their communities." Ogden Honors College Dean Jonathan Earle described the impact of the Scharfenbergs' gift as ensuring scholarship recipients have the tools to succeed. "Gifts like the Scharfenbergs' are exceptionally meaningful for the Ogden Honors College," Earle explained, adding, "Recruiting the best students from inside our state is a chief mission of the Ogden Honors College, and having this scholarship come from Germaine Laville's family helps a great deal in furthering that mission."